Our bindery is where a customer’s printed product is completed. It’s where huge pallets of printed sheets are cut and assembled together so pages fall in the correct order and are held together in the manner in which the customer intended. Sometimes the piece will be bound together by staples or glue in this step of the process where a machine called a “stitcher “takes the folded printed paper (called press signatures) and collates them together. Then “stitches” or staples are inserted into the signatures, binding them together. A project may have a self-cover where all of the bound pages are the same weight and color paper stock—or a finished piece may require that a heavier cover be bound onto the assembled piece to create its cover. 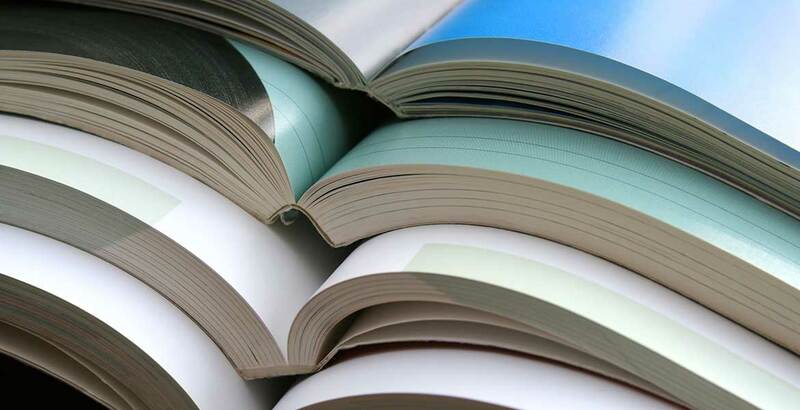 Other projects may require a metal or plastic coil binding – still others may be perfect bound, the binding assemblage that closely resembles a book’s binding. It all happens right here in our plant bindery! Please call for additional information, an estimate, or to see samples of the different print bindings available, or other specialty bindery services listed below.